Often imitated but never quite as good. 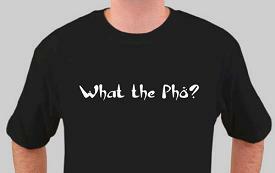 Show your pride with a pho-themed t-shirt. Traditional Vietnamese beef noodle soup. Enjoy it for breakfast, lunch or dinner. One who loves to eat Pho. A website devoted to spreading knowledge and appreciation of Pho. Read our comprehensive guide to pho menus, pho ingredients and pho bowl sizes.